Día de Muertos (November 1 and 2), or “Day of the Dead” as you may know it, is a Latin-American holiday that remembers the dead by celebrating life. You’ve probably seen some of the traditional imagery, like the ever-popular sugar skulls that seem to be everywhere this time of year. Many Latin-American families prepare altars in their homes to honor their deceased loved ones, and they fill the shrines with skull decor, marigold flowers, candles, favorite foods of the departed and drinks. 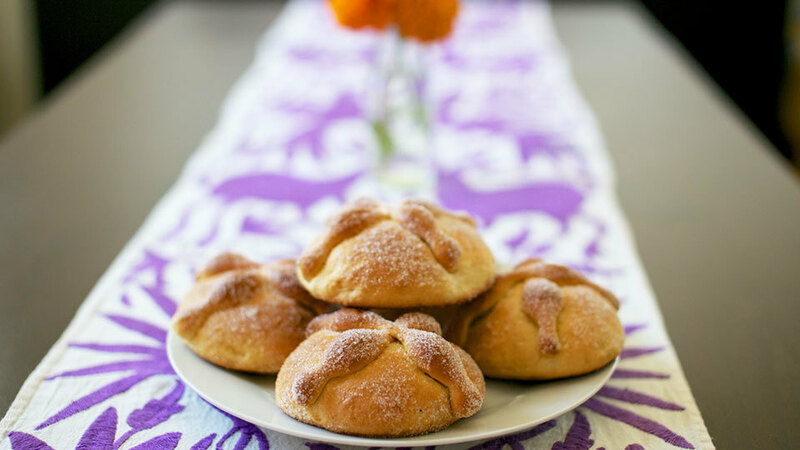 There is even a special type of bread made for the day called pan de muerto, or bread of the dead. It’s a holiday that brings the living and the dead together to celebrate the memories of loved ones through art and cooking. And just looking through Instagram snaps of everyone’s celebrations is giving us major #inspo for throwing our own Día de Muertos feasts. See some of the beautiful altars and foods from Day of the Dead. These bright and festive altars are brightening up our chilly fall. We love the use of colorful florals in this shrine. Bread of the dead and Mexican Coke (naturally) become the ofrenda, gifts of food and flowers that pay tribute to the deceased. These cookies in the shape of a marigold, pan de muerto and sugar skull are almost too cute to eat! These overflowing shrines are filled with all kinds of festive treats that are traditionally supposed to be enjoyed by both the living and the dead. Here’s even more sugar skull inspiration from Muy Bueno.